UCD is “a philosophy and methods, which focus on designing for and involving users in the design of computerized systems” (Abras, Maloney and Preece, 2004). 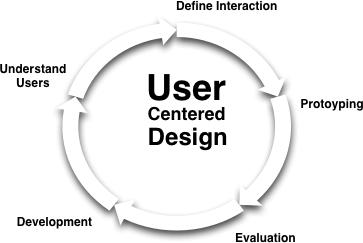 Design is driven and refined through iterative cycles of development and user evaluation. Our UCD framework puts forward an actionable and systematic approach for UCD techniques to be used throughout the lifetime of a project. We propose a method of UCD actions: these are research actions, where a UCD technique is deployed to answer a question about the design. What are the opportunities for a new technology to positively impact a given set of users in a given context? 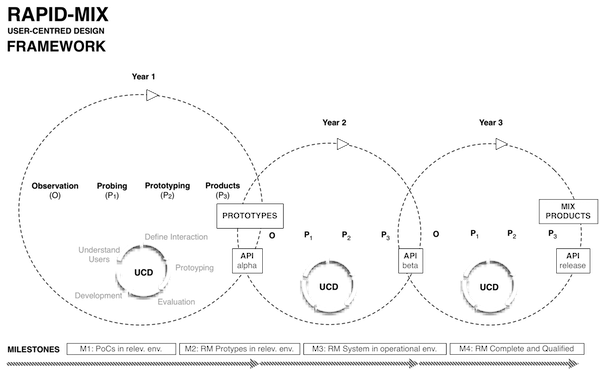 What is the design space of possible technologies? How might a particular design approach impact users in a given context? How does a particular design instantiation impact these users in this context, in reality? What are the consequences of different designs for users’ efficiency, effectiveness, satisfaction, ways of thinking and acting, relationships with each other, etc.? How do these change with time, experience, context, and type of user? Where are possible usability problems in a given design, and how might they be mitigated or corrected? public events, such as hackathons and workshops. interviews, questionnaires, targeted development sections with small numbers of developers. Periodic review of feedback from developers, e.g. via bug reports, feature requests, etc. Observation and interviews with personnel interacting with prototype technologies. What are we trying to find out about the product or prototype? Who will be the users engaged in this session? What techniques will be used? Who will run and document this action? What activities and/or materials need to be prepared in advance? What documentation will be collected?